One of the results of the economic squeeze on newspapers has been a loss of editorial talent, including copy-editing (has anyone else noticed how rough and sloppy the prose is getting? ), and publication of truly terrible stuff that a good editor would have protected us from.Â And at top-end outlets, like the New York Times.Â Poor Carl Levin and Angus King have a sensible op-ed in today’s paper that a copy-editor could have tightened and sharpened in a single pass, and the art editor, or whatever intern is doing that now, saddled it with a cut so bad as to garble their argument just by sitting there on the page. 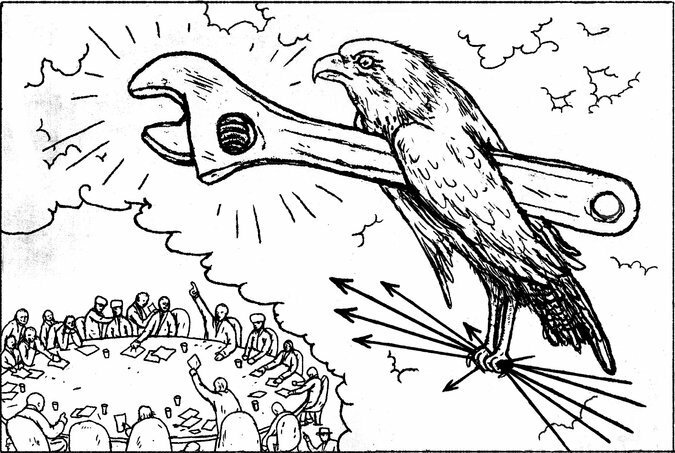 If I understand it properly, this picture is constructed around the expression “to throw a monkey wrench into” some sort of machinery, and the American Eagle is about to do it (L & K are warning against Congress ginning up new sanctions against Iran while negotiations seem to be working).Â Almost everything that could go wrong does, though. Only partly because the wrench isn’t a monkey wrench, but something miscalled (like Kleenex for tissue) a crescent — a useful thing that fixes stuff and has no association with sabotage.Â I had to deconstruct the picture for at least a minute before I got it.Â The only eagly thing about the bird, who could almost be a dove with malocclusion especially given its size compared to the wrench (one of my dead-end misreads, actually), is its beak. But in a cartoon, you need to be careful about the things that quickly identify your subject.Â If a bird is going to read as “the USA” it has to have white feathers on its head and tail, big strong feet with serious talons, and feathery legs. If it’s a hawk, what do the arrows have to do with it? Actually, nothing works here.Â The bird isn’t flying, nor sitting on anything (one of my wrong tries was that it was hanging on the wrench), and it certainly isn’t about to throw anything, as both its dainty little feet are tangled up with graphic symbols it took off a flowchart. The bird on our national coat of arms has real, physical arrows, and for a reason. If he threw the wrench into the negotiations as rendered (that is, rendered as an enormous poker game), it would fall on the table and astonish everyone.Â But it wouldn’t break anything; the metaphor needs something like a machine with gears and stuff…maybe with the diplomats turning a crank? A picture that has to be turned into a word paraphrase and then back into a picture isn’t really graphic, or anything really (maybe a Sunday supplement puzzle).Â Somebody at the Times decided they couldn’t afford an artist who was ready for prime time, couldn’t afford an art editor who could coach artists, and couldn’t afford a managing editorial staff who could look at a page and say “wait a minute!”Â Maybe they were right about what they could afford, but if so, this episode is exhibit 203b.2 that we’re losing Really Important Social Capital. This is a long post that sketches a system in which we can have about the right amount of digital goods at the right price, and pay the people who make them properly.Â IP engineers, lawyers, and economists, have at it: time to stop rearranging deck chairs and steer the ship.Â Â The central underappreciated insight in my view is that the digital content technology system cannot be fixed by torturing dead-tree rules to fit it: technology rights must be technologically administered. Not all of that infrastructure was physical: we also invested in all the knowledge in the libraries of those universities and the know-how in the heads of all the people who attended them, weights and measures standards so any 10-32 machine screw will fit the hole tapped with any 10-32 tap, all the music, books and movies, and more.Â “More” especially included a legal system that worked well enough to get those books written and songs played, at least as long as they had to be packaged in something that could be locked up in a room. An enormous system of legal and commercial machinery (i) makes it possible for you to read this, or to read anything, or to listen to music or see a show, and (ii) makes it worthwhile for anyone to provide it for you.Â This machinery was created by some of the most brilliant minds in the law, government, and business, but they made it for a world that no longer exists. When industrial machinery breaks, it produces less, or worse, stuff, and sometimes it maims or kills workers.Â The machinery of intellectual property worked more or less well until about thirty years ago, despite wrenches like mindless and venal copyright extension to make Disney heirs even richer being thrown into it.Â That machinery has not, however, survived being tasked to process digital content, which has broken teeth off its gears, garbled its control system, and clogged its conveyor network.Â Â Stuff is falling out of the system to be swept up as trash, lost in transit, delivered broken or with parts missing, sent to the wrong recipients, and it’s piling up in warehouses where no-one can use it.Â Half-finished goods sit, sometimes forever, waiting for essential parts.Â The waste of the most precious stuff in the world is bad enough, and the prices my students are paying for textbooks (and for my services) are bad enough, but today we learned that the malfunctioning machinery has killed a worker, and not just any worker but a genius engineer, and philanthropist in the best sense of the word, who had only begun to design priceless parts of it. Aaron Swartz’s death isn’t justÂ overreach or judgment error by a Boston judge and prosecutor, though if either of them ever againÂ dines with anyone whose cultural competence is higher than a Big Mac it will be an outrage.Â It was an industrial accident caused by ongoing, feckless, reckless failure to maintain the intellectual property machinery, a core piece of social infrastructure being run into the ground for greed (no, not for efficient price signals) by the ignorant, the frightened, and the incompetent.Â The reasoning of the captains of this industry, as their sales fall, bookstores close, newspapers shrink and close, and our best musicians wait on tables,Â goes as follows: “It’s our property, shut up!”Â It is a failure of the law to accommodate reality. Aaron Swartz died. He had “stolen” what always should have been free. Aaron Swartz died yesterday, by his own hand. He was 26, and facing up to thirty years in federal prison for downloading most of JSTOR. Prosecutors had offered him a plea-bargain involving confession to a felony and a year behind bars, but he’d turned it down. And (it seemed) remarkably calm under the looming threat of prison. Aaron Swartz’s crime was “stealing” what should have been free in the first place. Yes, someone has to pay for the process of academic publishing. But the right price for access to scientific knowledge is identically zero. JSTOR makes the world’s scientific knowledge available for free to those affiliated with JSTOR’s member universities. But in a sane world everyone would have that access, and the governments that spend money to fund research would spend a tiny bit more money to maintain a free research-access system. Lawrence Lessig makes the argument that the prosecution was over-zealous. More generally, we need to stop acting as if information ought to be bought and sold under a set of legal conventions devised for rival-consumption goods. The Constitutional power to create “intellectual property” in the form of patents and copyrights comes with the clause that it is to be used “to promote science and the useful arts.” The current system impedes both. It’s not technically impossible to replace it. But the business of selling what ought to be free is a big business, and it will take big political muscle to push it aside. If we all built it, who are we and what is it? Reihan Salam makes a much better case for the Republican view of public goods than the Republicans do. But he still leaves a lot out. The Republican convention contained a lot of claims, but the claims that were true weren’t substantive, and the claims that were substantive weren’t true. Those hungry for a serious piece of conservative argument should turn toÂ Reihan Salam’s postÂ on what the parties really think, and don’t always say, about public goods and whether the “you didn’t build that” argument really captures the essence of public goods. Higher taxes can be seen, in this frame, as a way to cut down tall poppies. Note that the valence would be very different if we all, or rather if all of us with jobs, should pay higher taxes to sustain the commonwealth, and high-earners should pay somewhat more than the rest of us. The tone would be very different. This is one reason why the â€œYou Didnâ€™t Build Thatâ€ theme resonates: it is a rebuke to the perceived punitive tone of the presidentâ€™s narrow case for taxes. 2. Smart conservatism is not atomistic but has a broader view of what counts as the social preconditions for prosperity than liberalism does. Conservatives and libertarians tend to understand Americaâ€™s public framework as something broader than the state. Rather they see it as as a system of rules, institutions, and norms. One concern is that the expansion of the state has compromised the effectiveness of our institutions, undermined important norms, and created a â€œpebbles in the streamâ€ dynamic in which the accretion of rules and regulation has contributed to stagnation. 3. Most of what government does has little to do with public goods anyway but involves transfers and insurance schemes that can actually crowd out public investment (here, and throughout, Salan cites Matt Yglesias, and seems tacitly to acknowledge Yglesias’ point that the Romney/Ryan economics would slash investment at least as much as it would slash transfers). Author Andrew SablPosted on August 31, 2012 August 31, 2012 Categories UncategorizedTags Conservatism, Economics, Liberalism, Paying for nonrival goods22 Comments on If we all built it, who are we and what is it? Of course government should support the arts.Â Unfortunately, as soon as we try to reduce this prescription to specific practices, it gets extremely messy.Â What level of government should give what to whom, under what conditions? What government programs, other than writing checks, matter?Â The New York Times offers a Room for Debate forum that assembles a bunch of arts advocates, plus a Cato Institute small-government ideologue, for a conversation that consistently, and typically, ignores many of the most important realities and constraints affecting this sector.Â Why do smart people leave their brains at the door and get all mooshy and soft-headed talking about art?Â Hats off to the Times for running a piece on this important topic, but shame on all the authors for an almost unrelieved collection of fact-free posturing and noodling.Â Not that they are unusual in this regard: reading most of what’s written about this issue could make a cynic think none of these people cares enough about art to actually think carefully and do homework.Â Sorry; arts policy doesn’t need wooly sentiment, pointing with alarm, doe-eyed begging and whining, or charity-case condescension; it needs the dignity of serious thinking that treats artists and their audience as grownups. This picture is a treasury of symbolism and metaphor. 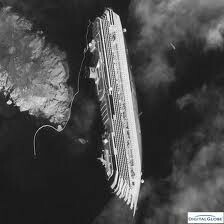 Helpless on its side, with an enormous hole torn in its hull, this disaster has already killed more than a dozen people who only wanted to have fun for a few days, ruined the career of the captain and possibly headed him for time in the slam, dented the balance sheet of some insurance companies, and dinged confidence in the whole cruise industry.Â The bleeding isn’t over. See the pathetic little line of boom strung out along the shore? The ship is liable at any moment to slide off its rock and go underwater, and it’s full of bunker oil ready to foul beaches for miles. What does it stand for…better, what in today’s news doesn‘t it remind us of!Â The world economy, run aground by expert leadership who just wanted to show offÂ how rich they could get?Â The American political process, set up for disaster by the Supreme Court and mismanaged by ideologues who think the only reality is what they can see above the surface of things (charts? we don’t need no stinkin’ charts! ), with more pain and damage looming?Â The Perry campaign, vacuous glitter and rhinestone bling dead in the water? This picture is a non-rival good, and serves any of those purposes, feel free. But my first association was with something that, if possible, is even more completely broken and more threatening than any of these: the economy of digital content.Â The wonderful structure of copyright, distribution, royalties, law, conventions, and contracts that brought us stuff to read, see and listen to for so long has sailed right into the very well-charted rock of virtual embodiment.Â Some pieces of it are still above the waterline, but they don’t work.Â And everything – everything – we are contemplating to do about it has about as much hope of success as that pathetic boom. No, I didn’t steal the picture; it’s a public domain Italian government satellite photo. But all the other pictures floating around the web are also non-rival goods, just like the songs and video files Megaupload is being taken down for circulating, and just like this blog post.Â The right price to consumers for all this stuff is zero.Â Most of it, especially with some attention from kids in Finland and Bulgaria and who knows where else, is also non-excludible in fact (I could have posted any of hundreds of copyrighted pictures of the Costa C. here and not been punished for it, nor you for looking at them).Â That battle is over and the technological facts have won, though there’s plenty of pointless damage yet to be inflicted as the content industries try to make gravity point up. The right price to creators and providers is not zero.Â Pretty simple design constraints, right: give content to consumers at a price of zero, and pay musicians, writers, and the like an efficient and just non-zero price to make it for us.Â Simple constraints don’t mean it will be simple to solve the problem, of course, but all the flailing about we’re doing with no good effect on this one is not a counsel of despair.Â Very similar problems have been solved quite nicely already, like the sidewalk I’m allowed to walk on for free and the park, whose gardener is not enslaved, but actually earns a nice civil service union wage. And all the clean air I can breathe at will that was quiteÂ expensive for the power plant and my car-driving neighbors to provide for me, and the complete absence of nasty foreign occupying armies provided by a military that pays its workers and ponies up for tanks and all the other gear. One might think we would be figuring out how to sail our priceless, glorious social capital ship of art and knowledge safely past these technical rocks. But we aren’t; we spent two or three decades arguing in the wheelhouse about whether citizens who just want to get smart and hear some music are pirates, and whether the earth could be flat if we just shout “property” loud enough, and refusing to look at charts that might be useful, and now the ship is wrecked. It will probably be harder, not easier, to right and refloat the longer we wait, and while we yammer about property rights and assigning blame, a large ugly plume of yuck is going to keep spreading across our civic life, as the content that does get provided is bought for us by the people who can afford to put it out under our broken system. Mediation is done in the spirit of recognizing the merits of both parties’ positions, and discerning a result with which both can be comfortable. After careful Solomonic reflection, the result I propose is thus: Kevin (unusually for him) is wrong, and Matt (more typically) is right. An mp3 file is not like physical stuff in the way Kevin says it is. Writing about my local radio options, around tax time when I always feel guilty about not giving enough money away last year, led to an expensive tour past the web cash registers of several public radio stations.Â My conscience is salved, but I’m still nettled by the system I have to deal with.